Story by Hunter Haskins. Photos by Andrew Richard Hara. I’m sitting shotgun on the ride up to the summit of Mauna Kea, a little carsick and feeling like someone sneaked industrial-grade intoxicants into my morning coffee. My legs are wooden and my speech stutters. Mauna Kea ranger and my guide for the day, Kelvin Andrade, is a three-year veteran of the summit. He asks how I’m feeling. Mauna Kea is the pinnacle (to pun again) of terrestrial astronomy. Due to the clear skies at altitude, accessibility and lack of light pollution, it is one of the best places on Earth to view the cosmos. Starting in the 1970s, thirteen observatories have been constructed at the summit, and they have produced world-altering science. Some of these telescopes are technological marvels, unique on the planet; others are classics, the workhorses of basic astronomy. All of them require constant maintenance and upgrades to peer ever more deeply and finely into a universe we’re just beginning to explore. Inside the Canada-France-Hawaii Telescope, which detects both optical light and infrared light. 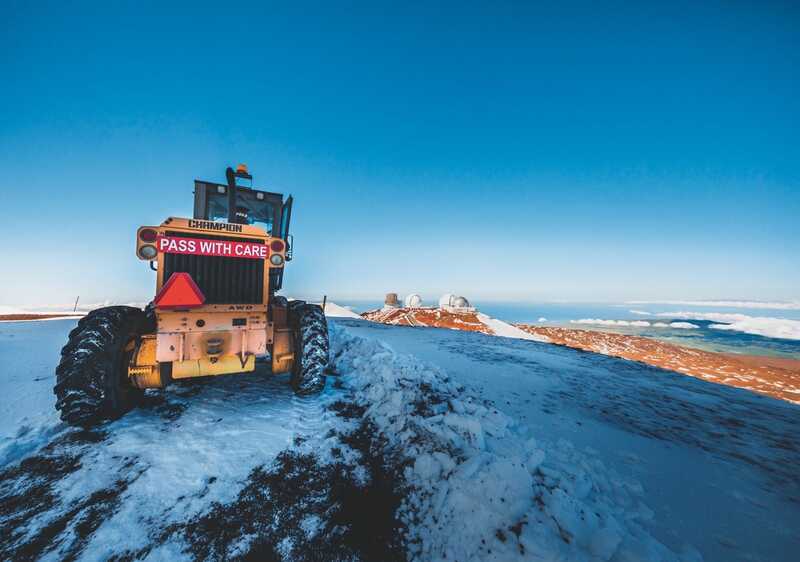 Andrade is taking me into the rarefied, clear and cold air atop Mauna Kea to watch as hardy technicians give a few high-tech telescopes an even higher-tech upgrade. It’s rare for someone outside the community of researchers and support staff to be allowed access to these facilities, even rarer on days when they’re undergoing delicate maintenance and upgrade work. Though I hardly have the lungs for it, to someone like me, who loves tech and astronomy, this is Graceland. Andrade stops not far from the 13,796-foot peak and a safe distance from the Canada-France-Hawaii Telescope. Chunks of ice and slush slide from its pure-white dome as they melt in the morning sun. It’s a big day for CFHT; inside its huge dome the staff, a mix of French, Canadian and local technicians, is uncrating parts of the new SPIRou sensor. Once assembled in the massive clean room and fiber-optically linked to the telescope, SPIRou will measure the subtle wobble of distant stars, a telltale sign that they might host a planet. Starting observations in 1979, the pioneering 3.6-meter CFHT was one of the more sophisticated telescopes operating on Mauna Kea (and on Earth) at the time. It was designed to detect both optical and infrared light (light you can see, plus thermal imaging). CFHT data was the envy of astronomers worldwide, showcasing Mauna Kea as a premium site for astronomy. Its images were sharp from the get-go, good enough to detect evidence of mysterious dark matter (and verified by the Hubble Space Telescope). When the CFHT started observations atop Mauna Kea in 1979 it was one of the most sophisticated telescopes in the world. Its old but proven equipment is mixed in among state-of-the-art electronics. The control panel still has the kind of gauges and lighted buttons you’d see in a ’70s James Bond villain’s lair, right beside the updated digital display with real-time video, weather satellite feeds and other atmospheric data essential for astronomy. On the fifth floor is the observation deck, where the enormous yellow telescope is mounted on hydrostatic bearings and a gimbal structure known as a yoke-and-horseshoe. It’s almost as cold inside as it is out. “We keep it air-conditioned to within a degree or two of the lowest temperature forecast for tonight so the optics won’t fog,” says Ivan Look, who’s spent the last thirty years as the mechanical design engineer for CFHT. Look is proud of the updated cooling system that supports the SPIRou sensor (which is kept at -203.15 degrees centigrade, plus or minus .001 degree). It requires less maintenance while using some creative plumbing that looks like a giant car radiator. Cooling is critical to a telescope that captures visible and infrared light, some-thing that CFHT pioneered. If the sensors and mirrors get even as warm as the frigid summit temperatures, the signals become “noisy.” Clean signals are essential, especially if you’re observing a very cold, faint object that suddenly comes shooting through our solar system. A guest instrument has recently been added to the CFHT’s mix. The newly installed SPIRou sensor allows astronomers to measure the tiny wobble in a star’s position that indicates the presence of extrasolar worlds. Teaching the CFHT new tricks paid off almost immediately, I’d later find out. With the SPIRou plugged into the CFHT, test observations of well-studied stars were exactly as crisp as expected—a bit like hitting the bull’s-eye the first time you throw a dart. SPIRou can now compete with the orbital planet-hunters by measuring the tiny wobble in a star’s position that indicates the presence of extrasolar worlds. The prize, though, is the ability to study the weather patterns of distant stars like brown dwarfs or giant gaseous orbs that are not quite stars. That’s a big if: It’s a bit like trying to forecast the weather on Jupiter through a pair of binoculars. But it’s a start. is being attached to its massive mirror. It takes three elevator rides to get to the top of Subaru: one to the break room, alive with chatter in accents from around the world; another to the observatory floor, filled with machinery; the last to the upper reaches of the observatory. Each one has emergency supplies stacked in a corner: an inflatable mattress, a radio and a bucket marked “Emergency Restroom.” Turns out people get trapped during power outages. The Subaru Telescope’s eighty-ton crane and its signature blue metal enclosure are engineered to rotate as one above a four-story sublevel. We leave the elevator and walk out on the level four mezzanine. I grip the hand-rail to steady myself against vertigo because I am looking down on the seventy-two-foot-tall telescope. Subaru is a beautiful giant, gleaming in blue aluminum thermal cladding. It is one of many telescopes in the 8.3-meter class, with mirrors bigger than most swimming pools. Above me is an eighty-ton-capacity crane and the structure supporting the retractable roof. 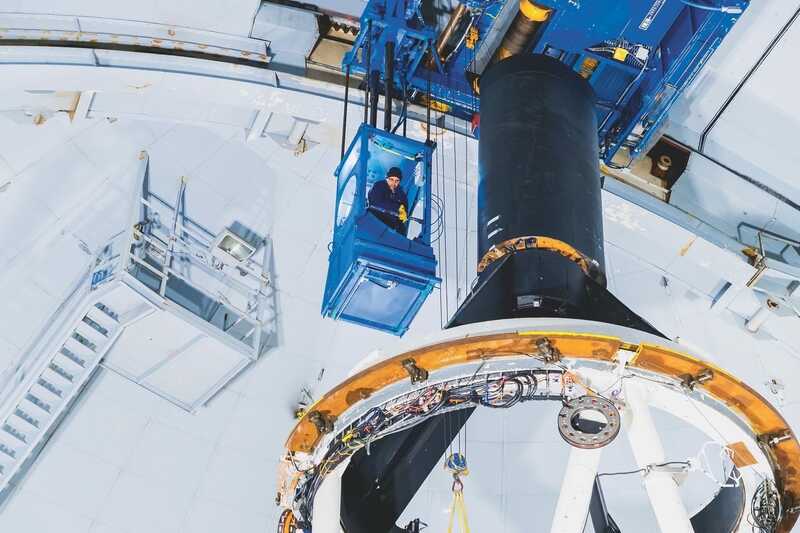 Down below, technicians are preparing to attach cables to the MOIRCS, an instrument about the size of a beer keg and weighing 2,160 kg (according to its placard). Like the SPIRou on CFHT, it requires a lot of cabling and a complicated cooling system. Subaru’s primary mirror takes up more floor space than my apartment, though it’s only about eight inches thick, and like CFHT, it can detect both optical and infrared light. Small temperature changes can fog the mirror and, because it’s so big, can even warp it (thus the blue thermal insulation). Moving the telescope to aim it can also result in warping, so Subaru’s mirror is kept perfectly reflective by “adaptive optics”: A twenty-watt laser (a half-watt laser could blind you) detects atmospheric distortions, then 261 robotically controlled arms gently massage the mirror to compensate, making it a sort of living membrane. To keep the mirror sharp, its surface is blasted once a month with dry-ice crystals, which gently scour away accumulated dust. But this doesn’t keep the mirror clean forever, so every four years it’s lifted off by crane and lowered through retractable doors in the floor to a huge sublevel where the thin aluminum reflective coat is removed and reapplied. Subaru is Japan’s largest telescope. Some believed building a telescope of its size would be impossible, so it’s no surprise that its success is a point of national pride. Such a Herculean effort was undertaken for an equally epic endeavor: to answer questions about the origin of the universe. Subaru’s huge mirror can collect incredibly faint light and feed it into specialized instruments like the MOIRCS, which can observe the gravitational behavior of distant galaxies in order to refine the Hubble Constant, or the speed at which the universe is expanding. Having a precise measure of such a thing is essential for “big picture” astronomy. The Subaru Telescope’s latest upgrade, the Multi-Object Infrared Camera and Spectrograph, or MOIRCS, will enhance the telescope’s ability to detect extrasolar planets, among other capabilities. With MOIRCS working with Subaru’s other impressive instruments, like the Hyper SuprimeCam (a digital still camera that’s taller than a human being), Subaru has recorded the telltale spectral signals of stars in galactic formations eleven billion light-years away—regarded as the current limit of how far we can see into the past of the cosmos. To top that off, twenty-four separate galaxies were precisely examined in just two hundred hours of observation, much less time than many other telescopes would require. Subaru plus MOIRCS found that these distant and ancient stars were not spring chickens. They were mature, with a similar chemical composition to “nearby” mature galaxies. Because the MOIRCS-enabled Subaru can collect so much data, astronomers have refined their estimates about the age of the universe and concluded that it is billions of years older than previously thought. W.M. Keck Observatory houses the Keck 1 and Keck 2 telescopes, each with thirty-six hexagonal mirrors that form a massive, ten-meter reflecting surface. Here, Keck technicians undertake the delicate procedure of jacking a mirror segment from its mount for repair and cleaning. Just up the hill from Subaru, the twin domes of the W.M. Keck Observatory house telescopes even more astonishing than the Subaru, whose mirror is the maximum size a single mirror can be. But Keck’s mirrors aren’t single: Thirty-six“small” mirrors are fitted together, forming ten meters of perfectly reflective surface. 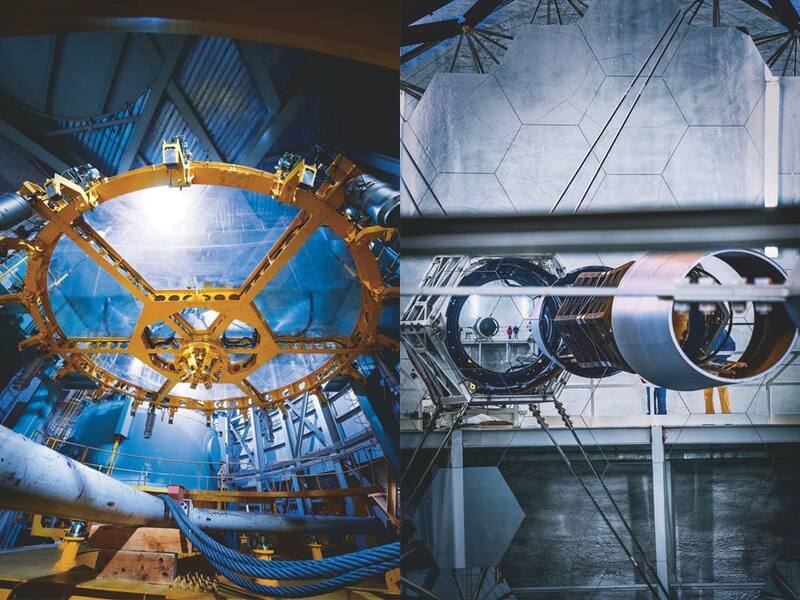 Even its designers called Keck 1 “the impossible telescope.” But after Keck 1 was completed in 1990, proving its moniker wrong, Keck 2 was constructed. Combining the two images from each telescope gives single clear images of things otherwise impossible to see from Earth, including faint planets orbiting distant stars. Keeping Keck’s seventy-two mirrors functional requires daily maintenance. As soon as we enter the low building connecting the observatory’s twin domes, we’re met with the urgent cry, “Mirror in the hallway! Mirror in the hallway!” I sneak a cautious peek; getting too close to a mirror segment could contaminate it. The eight-foot-tall hexagonal mirror segment nestles in a wheeled cart, flanked by technicians in clean-room suits. As soon as the mirror is secured in the clean room, we’re allowed to move on. To ensure the sharpest possible images, Keck’s mirrors are massaged to optical perfection by a sophisticated system of actuators, which can adjust for distortions caused by temperature, humidity and atmospheric conditions. John Baldwin, Keck’s summit superintendent, has the job of choreographing the complex ballet of maintenance tasks. At a meeting with some fifteen technicians in the break room, he lays out the day’s schedule. Keck 2 needs its tertiary mirror swung out of the way, and one of its lasers needs maintenance (Keck has two twenty-watt lasers, of course). But the big job is the “SegEx,” or segment exchange, of three delicate and irreplaceable mirrors. These orphan, refurbished segments need to go from clean storage to a segment reunion in eight hours. And they need to be perfect and unblemished during the journey. “It’s like replacing spark plugs on an engine while it’s still running,” Baldwin says, and it all has to be completed by nightfall so observations can run on schedule. Machinist Adam Vandenberg (left) and engineer Sam Park approach Keck I’s secondary mirror. Just as with the Subaru, robotic actuators (called “whiffletrees” here) deftly massage the mirror to optical perfection, but the attachment points between the actuators and mirror had begun to fail. The Keck Observatory crew invented a highly experimental method to refurbish the attachment points in the lab, down the mountain in Waimea. It had never before been attempted, but it worked. Keck 2 recently had all thirty-six segments removed, fixed and replaced; what we’re witnessing today is the beginning of the whiffletree attachment point repair of the Keck 1 segments.